Democrat Jon Ossoff, who is running to fill the vacant seat for Georgia's sixth congressional district, criticized the influence of super PAC money on Tuesday, the same day that a Democratic super PAC released an ad supporting him. The House Majority PAC, a leading super PAC that supports House Democrats, released the ad "Signs" against Ossoff's Republican opponent Karen Handel, saying Georgia "cannot afford" her. On the same morning the ad was released, Ossoff appeared on CNN's "New Day," where he attempted to push back against co-host Chris Cuomo's question about a report saying that 95 percent of his campaign contributions from the first quarter of this year came from out of state. "Vastly more folks in Georgia have contributed to my campaign than have contributed to my opponent's campaign," Ossoff said. "When you have these super PACs coming in from Washington with anonymously raised special interest money running endless attacks, it is necessary to raise significant resources to fight back. And my campaign has raised those resources by a grassroots fundraising in average contributions of less than $50." 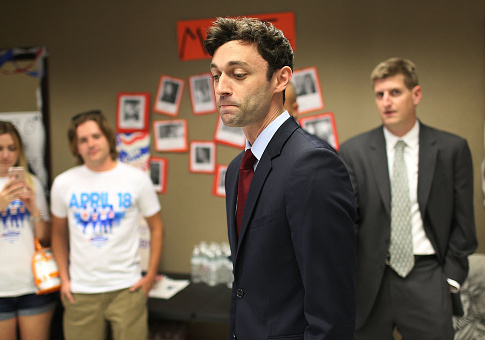 Some observers noted that Ossoff's comments came the same day a PAC came out with a new ad supporting his candidacy and attacking his opponent. The House Majority PAC announced a couple weeks ago that it was investing $700,000 in Ossoff's special election race. "The large investment includes a $500,000 broadcast television buy in partnership with Patriot Majority starting Tuesday, May 30th and an unprecedented $200,000 Get-Out-The-Vote field effort beginning this weekend and running through Election Day," the group said on May 18. The election runoff will take place on June 20 and determine who will replace former Rep. Tom Price, who vacated the seat earlier this year to become President Donald Trump's secretary of health and human services. This entry was posted in Politics and tagged Chris Cuomo, CNN, Donald Trump, Georgia, House Democrats, Jon Ossoff, Tom Price. Bookmark the permalink.